We interrupt Christmas baking to bring you some Christmas decoration ideas. In case you couldn’t tell, I love Christmas! It’s my favorite time of the year and I love decorating every available space. Well, except my car but I’m sure I will do that at some point too. I’ve got trees all over my place – small trees, old trees, metal trees, DIY trees. Snow villages, villages on cake platters, and in Apothecary jars galore. 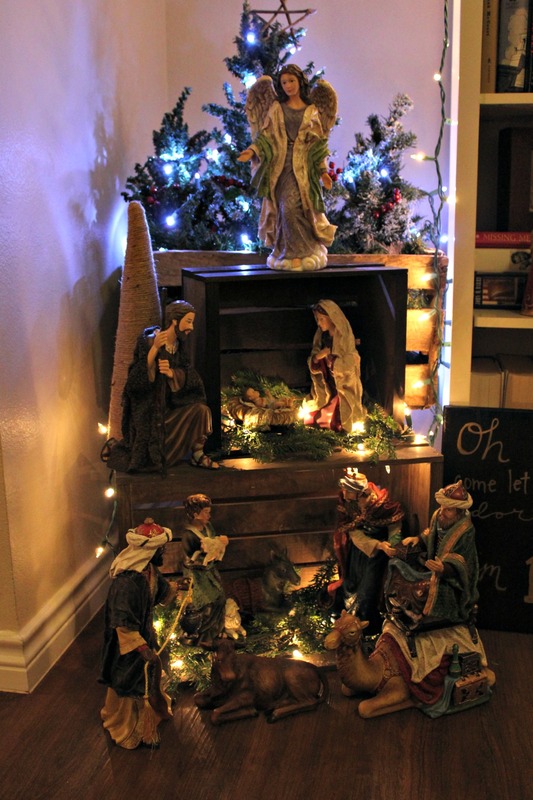 Growing up, my mom always had nativity scenes around the house. I have small ones but I finally bought one that I could display in a way I saw on Pinterest last year. I’ve been waiting all year to put this together and I LOVE it! Stain wood crates and let dry for several days. Place largest crate on the bottom followed by next size. Place lights on the bottom of the crates. Top with greenery. Place Nativity figures in the crates. Pinterest is my go to inspiration this year for my new DIY Christmas projects. 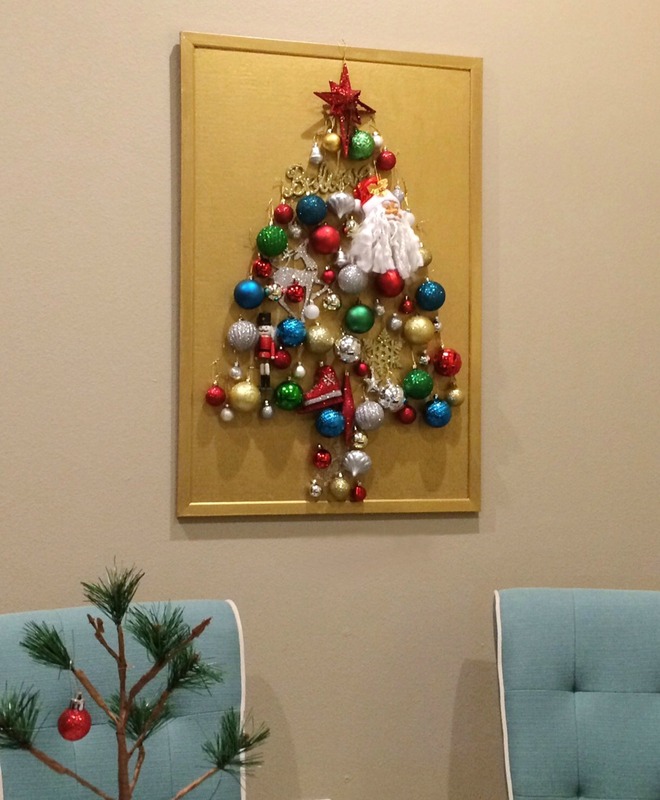 As soon as I saw a tree on a frame on a wall, I knew I wanted to recreate it for my office. A local artist paints amazing art on cardboard so at first I did the tree on cardboard. I did not love it so I redid it on a bulletin board and it turned out perfect for me. It’s the right size and it makes me smile all day long. Paint board trim and bulletin board with gold paint. It will take several coats to get it to the desired color. Add glitter paint – as the last coat if you want it glittery. Add ribbon to ornaments to hang. 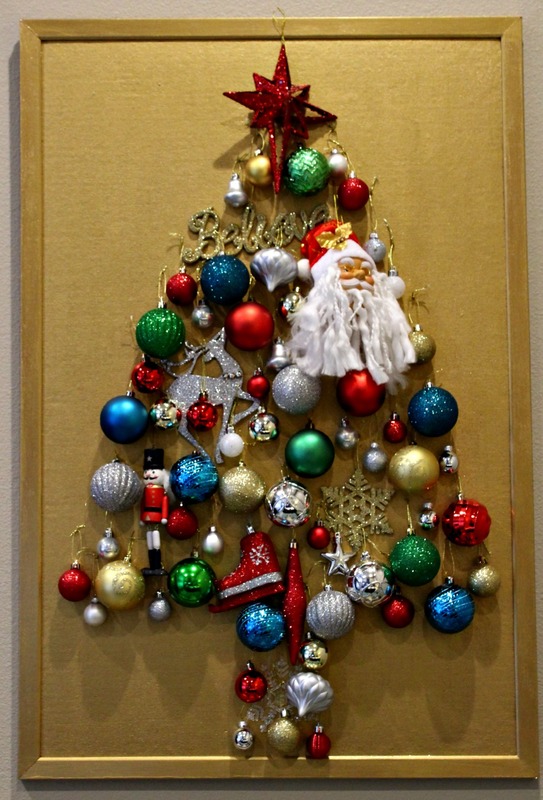 Place ornaments using stick pins.